Will CJNT continue to Use Public Airwaves to Anglicize Québec’s Immigrants? This is exactly why Québec must become an independent country. Once upon a time, back in the late 90’s, Québec’s different cultural communities had their own TV station, called la Télévision Ethnique du Québec. It was a public access community station that broadcast cheap looking shows of uncomfortable looking men and women sitting on chairs and talking in one of 35 languages in front of cartboard sets. Of course it sucked. How could immigrants and wide-eyed community activists fresh out of CEGEP ever produce any good TV? Especially back in those days before digital when making TV actually cost money? Yeah, but it was local TV. Made by Montreal’s immigrants and about their lives and concerns. In the summer of 1995, a date which I am sure has no significance whatsoever, Canada’s guardian of the airwaves gave away TEQ’s valuable cable channel to some vast media empire that eventually traded it to CanWest media, the owners of the Montreal Gazette, Global TV and the National Post. Within 18 months of the sale, as many as 20 local shows were replaced by shows produced in Toronto or the States. Interestingly, the cut shows were essentially those “from communities more integrated in the francophone majority”, according to Pedro Quirido, president of producers union of TEQ. Eventually locally produced programming was all but abandoned and actual ethnic content dropped from 100% less than 60%. David Letterman and infomercial made up the rest of the grid. “One City, many Cultures”, became CJNT slogan. To which we can add: One language. Yep. Nearly all of the station’s ID and promos suddenly became all-English and French became just another one of Montréal’s linguistic communities. Montréal’s “multilingulal” TV station still only has an English only website. Just like the founders of the station warned ten years ago, the owners of the Montreal Gazette transformed a TV station run by and for Montréal’s ethnic communities into a pedagogical tool used to perpetuate the myth that Québec’s allophones and anglophones are one and the same community and the “ethnic” programming became like training wheels on a bike used to train immigrants into consumers of anglo media. …or they do know, and they are trying hard to do something about it. You know, for all the angst about the use of English by Québec’s immigrants, the majority of them are already part of the French-speaking community when they get here! Seven out of the top 10 countries of origin of immigrants are part of the Francophonie. The US is the only English-speaking country of origin in the top 10 and, please, I beg you to argue Americans don’t have acces to enough TV in their language. French is still the most used language by 60% of immigrant workers, it is the language their children study in and the language of the majority of the people who live around them. There is no justification for CJNT treating them like generic Anglos. It’s not based on demographics, culture or any real numbers. Except economics. Of course, the owners of CJNT are going to trash locally produced programing in favour of cheaper mass produced Toronto and American fare. And of course a media empire in the business of selling English-thinking minds to advertisers will use all its ressources to train and format more and more English-thinking minds and consumers. That is why they put on air a channel where nearly all station IDs, commercials, and promos are in English and an English only website when targeting a market that is mostly French-speaking and living in a city where French is supposed to be the common language. That’s somewhere between disrespectful and socially dangerous. And it sure as hell is not an innocent decision. This week CanWest Global sold CJNT to Toronto’s Channel Zero. Will the pornographers give back the station to cultural communities? It’s doubtful. Not only did the CRTC not demand that the station stop acting like an ESL network, it straight out relieved the new owners of of any obligation to use any French at all! (Which is not a reasonnable decision, Fagstein, if CJNT continues to broadcast in English). Read all about the company’s purchase of a multilingual channel in a French-speaking city in their English-only press release right here. The CRTC’s decisions consistently reduced the amount of programing available to cultural minorities in their language, encouraged the exclusion of immigrants from Québec society and CanWest didn’t even make any significant money. This is a perfect illustration of why a Canada-wide body like the CRTC is inadequate to govern Québec’s airwaves. And this is why Québec should become it’s own country. It turns out Montréal is not the most heavily taxed place in North America and that the cost of living is lower in Toronto than in the 514. Every year the people at the swiss bank UBS publish a ranking of the cost of living in the world’s major cities based on the price of McDonald’s double story fat, sugar and salt delivery device. In 2009 Montrealers had to work an average of 15 minutes to pay for a Big Mac, a full 3 minutes more than those slackers in Toronto. Both cities are way below the world average of 37 minutes. Another very juicy statistic compiled by the swiss bankers is the share of their salary workers in the world’s cities have to hand over to the governement in the form of taxes, social security, pension funds and medical insurance (whether private of public). Power up your truth protection shields, Angryphones and CJAD listeners, you are not going to like this one: it turns out Montrealers get to keep 76% of their income for discretionary spending, more that the 75% Torontonians get to keep and even more than the mere 72% the citizens of New York City and Chicago get to take home. And this would probably also be a good time to mention that Québec currently has a lower unemployment rate and lower corporate taxes than Ontario. I don’t know about you, but I blame the separatist. In 1969, just a couple of years after the United States government had to send in the army to protect black students being integrated into Little Rock, Arkansas schools in spite of the violent opposition of a certain segment of the white population, the municipality of Saint-Léonard on the Montreal island went through it’s own episodes of violent riots over the integration of minorities. The only difference is that in the case of Saint-Léonard, the white, French-speaking, majority was rioting against segregation, not in support of it. Québec’s segregated school system is as old as Canada. It was a compromise of sorts between the Protestant industrialists of Montreal and the all powerful Catholic clergy who agreed that the province would have two completely separate and independently run school systems : one Protestant, one Catholic, which with time morphed into French and English-language systems. The dual school systems were constitutionalised in 1867 and, to this day, Québec is the only Canadian province constitutionally obligated to maintain « separate but equal » schools. The Parti Québécois did it’s best in 1977 to create modern integrated system for all children, regardless of their origin, religion or home language. Bill 101 established that all of Québec’s children would from now on study and receive their education in French, the majority’s language. Except for Québec’s English-speaking minority, of course, who’s right to it’s own parallel school system was protected. To this day, anyone who has studied at least one year in an English school somewhere in Canada is allowed to opt out of the majority’s school system. This, of course, is rationalised on the principal of some supposed right of children to receive education in their language. That’s interesting because, at least in Montreal, the majority of English-speaking youth are not studying in English at all! According to the English Montreal School Board as many as three out of four primary school students spend most of their schoolday in classes taught in French. The so-called “core” program where the majority of classes are taught in English is the least popular of all the school board’s options and is being abandoned by parents who demand immersion and billitteracy curriculum for their children. Outside Montreal the situation is even stranger with many English schools having a majority of French students and very few actual Anglos exercising their right to receive an English-language education in Québec. In Québec City close to 60% of the students in English schools are Francophones. This is possible because French-speaking, or for that matter, any family that has obtained a certificate of eligibility to English schools through, for example, a mixed marriage, can keep passing the privilege along to further generations until the End of Time. (For example I posses one of the fabled Certificates of eligibility even though I was raised in a French-speaking household because my father was an alumni of the very English Lower Canada College. Had I exercised that right, I would have been able to pass it on to my descendants, regardless of the language they speak at home, as long as at least one kid from every generation studied for at least one year in an English school somewhere in Canada. I, however, decided not to follow my father’s footsteps in the land of crew cuts (and also shattered my mother’s dream that I would study with the Jesuits of Brébeuf College like Pierre Elliot Trudeau) and once the ultra-nationalist unionized separatist teachers of l’École Notre-Dame-de-Grâce primary school were done thoroughly brainwashing my young impressionable mind, I decided to go to a multicultural French-language public High School instead. As even the Montreal Gazette reported, the result is technically bilingual kids who don’t know any French people and who are uncomfortable ordering a burger in French at McDonalds. On the French side there is growing tension between proponents and opponents to the kind of bilingual programs that have become common on the English side. While there is a lot of demand for them, opponents feel that the French schools’ mission of integrating immigrants into Québec society, especially in Montréal, could be seriously compromised if more English was introduced in the schools. As a result, many French-speaking families in Montreal are massively abandoning the public school system for private schools that offer, among other things, better English classes. Between 2001 and 2006 the number of students in Montreal’s private schools leaped by 30%. All this together leads to a profoundly dyslexic school arrangement. Immigrants to Québec are now intergrating themselves into Québec society in schools with no French-speaking Québécois, while Québec Francophones send their children to private schools. Montréal Anglos are building their own parallel French school network with no French students while Francophones in the rest of the province are keeping an English school system alive even though there are no more actual English-speaking students. Like most well informed Québécois passionate about North American Francophonie, I know just about nothing about the Acadians. Acadie is a State of Mind of a Nation of about half a million French-speaking people spread around at least five canadian provinces and a couple of american states who’s history and culture is completely different from Québec’s. They came over from a different part of France at a different time in history and are extremely proud about their distinct heritage. The Québécois don’t know or care about this and just assume they’re some families from Beloeil who got lost on their way to Cape Cod. 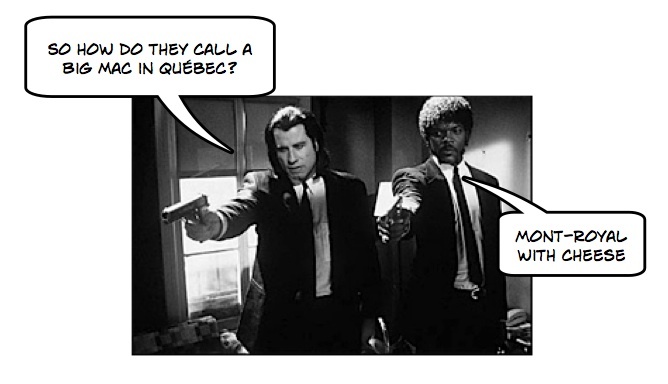 In that way, Acadie is to Québec what Canada is to the United States. All I know about Acadie I learned from my sister who figured out she could skip Cegep and graduate a year early by going to the Université de Moncton, the only major French language university in Canada outside Québec. My sister spent five years living among the Acadians, learning their stories and their language, Shiak, a blend of French and English. (Which, of course, is completely different from Québec’s Joual which is a mix of English in French). She also learned the difference between an Acadian and a Brayon and the strange diet of this strange place wher poutine has nothing to do with cheese and gravy. She told me about how there weren’t many Québécois at the Université de Moncton except for hockey players on scholarships. Apparently Acadians can’t skate. Who knew? There were a lot of Franco-Canadians from other provinces, however. Many militant Francos who wanted to study in French but were extremely bitter over Québec wanting to separate from Canada and the Québécois’ tendency to treat French culture outside their province as moribund, or, in the words of author Yves Beauchemin, as a still warm corpse. Francos from the strangest places–Yukon and a village in Alberta eight hours north of Edmonton–travelled thousands of miles to Moncton specifically because they didn’t want to study in Québec. There were also kids from France, Gabon, Mali and Luxemburg and today, even though Moncton is still a mostly English-speaking town, most immigrants and newcomers are part of the French-speaking community. That’s Acadia succeeding where Québec still struggles. At my sister’s graduation the valedictorian was an algerian Berber who’s life as an emmigrant had actually started in Glasgow. (You can just imagine the scene when he arrived in New-Brunswick and some bureaucrat decided he couldn’t possibly be speaking English because of his scottish accent and sent him to French school.) To this day he wears an Acadian flag pin–a France flag with a yellow star in the corner–on his vest when he teaches math at the École de Technologie Supérieure engineering school in Montreal. Oh Yeah… just about every single one of my sister’s acadian friends are now living in Montréal because it turns these militant Francos figured out you can’t work in French anywhere except in Québec. 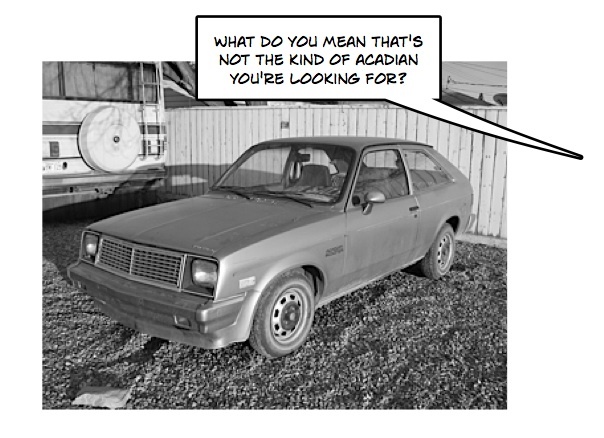 Check out the Acadian National Congress, on now.